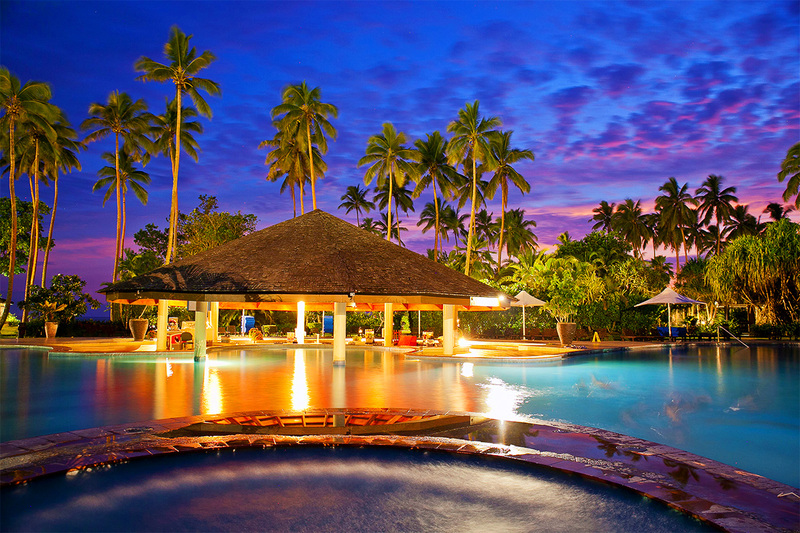 5 night family getaway to Naviti Resort Fiji with ALL meals & ALL drinks, babysitting, airport transfers & more! 2 adults & up to 2 children |	Typically $3,407! This beachside deluxe resort on Fiji’s Coral Coast delights and was awarded the 2016 Travellers’ Choice Family winner from Tripadvisor. The resort boasts a large swimming pool with a children’s area plus a swim-up pool bar, on-site 9 hole golf course, tennis courts, gym facilities, Joy day spa, 4 restaurants including a cocktail bar perfect for sunset drinks and a kids’ club for children aged 5 – 12 years. Let this magical accommodation enchant and inspire you while overlooking the captivating South Pacific. Your package includes 5 glorious nights in an Ocean View Room with return airport transfers, ALL meals & drinks, free babysitting, bonus cruise, snorkelling and much more! The well-appointed Ocean View Room boasts designer furniture, furnished balcony or patio and a view overlooking the enchanting Pacific Ocean. Second Kids Rooms for Large Families: a second interconnecting kids room is available for a maximum of 3 children 13 years of age and under. See fine print for more. Your package includes 5 glorious nights in an Ocean View Room for 2 adults and up to 2 children with ALL meals & drinks, transfers, free babysitting, bonus cruise, snorkelling and much more. Free Kids Club for children aged 5 – 12 years. Open 10am – 10pm daily. Closed during meal times. Travel until 31 March 2017! Travel can only commence at least 7 days after purchase. Not Included: Flights, Travel insurance, Visa. Airport Transfers: return airport transfers are provided from Nadi airport. Room Capacity: Ocean View Rooms can accommodate a maximum of 3 adults or 2 adults and 2 children 13 years of age and under. Bedding Configuration: 1 x queen bed and 1 x single bed or 2 x double beds or 3 x single beds. Second Kids Rooms for Large Families: a second interconnecting kids room is available for a maximum of 3 children 13 years of age and under. Interconnecting rooms are subject to availability at the time of booking. Child Policy: a child is considered 13 years of age and under. Children 14 years of age and over are considered adults and must purchase an adults package. Cots: are available free of charge however must be requested and are subject to availability. Festive Season Meal Surcharges apply for travel including 25 December 2016 and 31 December 2016. Surcharges apply for both adults & children for Christmas Day Lunch (approx AUD$40 per adult and AUD$25 per child) and New Years Eve Dinner (approx AUD$65 per adult and AUD$40 per child). Surcharges are payable directly to The Naviti upon arrival. Beverages are limited to one (1) drink per person per order. All beverages must be consumed in an operational outlet only. The all-inclusive beverage package does not include the following beverages: mini bar, bottled beers, bottled water, milkshakes, speciality coffee and room service. Cocktails with local based spirits are charged at FJD$10 per cocktail. Meals include buffet breakfast, buffet or a la carte lunch and dinner at selected restaurants. Meal times as follows: Breakfast 7am – 10:30am, Lunch 12pm – 2:30pm and Dinner 6:30pm – 9pm. Children’s menu available at selected restaurants. Free ice-cream for kids is available from 11am – 7:30pm daily and does not include New Zealand Natural ice cream. Minimum 3 years of age. Children aged between 6 months and 3 years require one dedicated nanny. Golf: excludes balls and use of motorised buggies. Additional charges apply & are subject to availability. Bay cruise, coral viewing and snorkelling cruise: are all subject to weather and tidal conditions. Children under 13 years of age travel free of charge with an accompanying adult. Since 1988, lush sophistication and stunning hospitality have flourished at The Naviti Resort in the Fiji Islands. 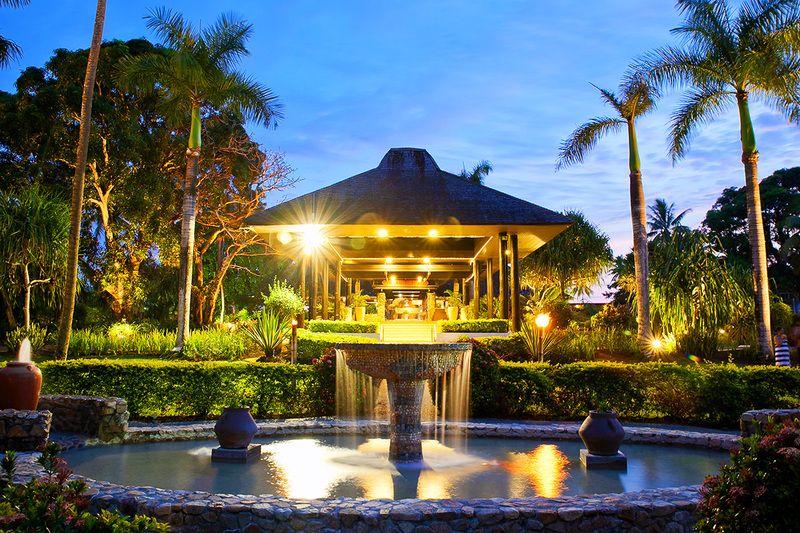 Nestled within 38 acres of vibrant, tropical gardens and fronting bronzed-sand beach. This beachside deluxe resort on Fiji's Coral Coast delights and was awarded the 2014 Travellers' Choice Family winner and 2014 Certificate of Excellence awards from Tripadvisor. The resort boasts a large swimming pool with a children’s area plus a swim-up pool bar, on-site 9 hole golf course, tennis courts, gym facilities, Joy day spa, 4 restaurants including a cocktail bar perfect for sunset drinks and a kids' club for children aged 5 – 12 years. Let this magical accommodation enchant and inspire you while overlooking the captivating South Pacific. Your package includes 5 glorious nights in an Ocean View Room for 2 adults and up to 2 children with return flights, ALL meals & drinks, transfers, free babysitting, bonus cruise, snorkelling and much more! 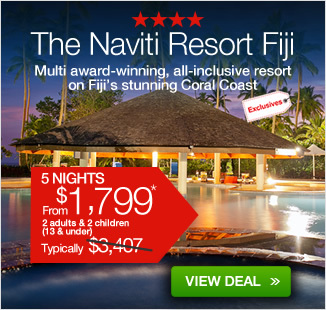 Your Naviti Resort Fiji getaway is subject to availability at the time of your booking. We advise you to book early to avoid disappointment.